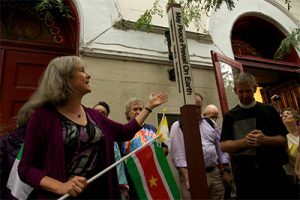 On Thursday, August 8th, a Peace Pole was unveiled outside St. John’s Lutheran Church at 81 Christopher Street in the heart of Greenwich Village. Pastor Mark E. Erson led a beautiful and prayerful ceremony to inaugurate the Peace Pole, inscribed with the words “May Peace Prevail on Earth” in German, Finnish, Japanese and English. Rev. Erson recited the prayer in German to honor the founders of the church, and requested the assistance of Rev. Tiina Talvitie of the New York Finnish Lutheran congregation and performer Atsuko Yuma for the Finnish and Japanese translations, then invited everyone to say the prayer in English. 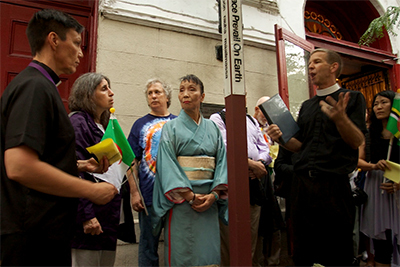 Deborah Moldow, UN Representative for the World Peace Prayer Society, spoke briefly about the Peace Poles around the world and then led everyone in a World Peace Flag Ceremony. 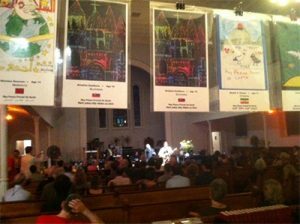 Everyone then processed into the church with the flags of many nations for a night of entertainment and a special tribute to the memory of Toshi Seeger, the late wife Pete Seeger, who grew up in Greenwich Village. The event was organized by peace advocate SuZen, who has been holding Universal Peace Day programs since 1984 to transform a remembrance of horror into a rededication of life. The evening of dance and music featured Atsuko Yuma, Russell Daisey, The Peaceniks, Hilario Soto, Bill Shuman, Ray Korona, Julie Lauren Stevens, and a special performance by Peter Yarrow of Peter, Paul and Mary. 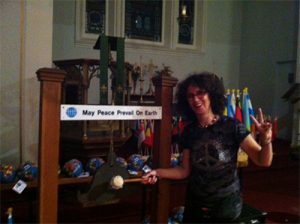 On display throughout the church was also an exhibition of children’s art from Peace Pals International, a program of The World Peace Prayer Society that promotes the message “May Peace Prevail on Earth” and hope for peace. 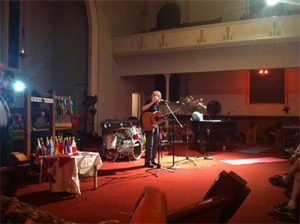 This event was organized by St. John’s Lutheran Church and the NYC Peace Museum, and sponsored by The World Peace Prayer Society, Bethel Woods Center for the Arts, Hugg-APlanet, Good News Broadcast, and We, The World.